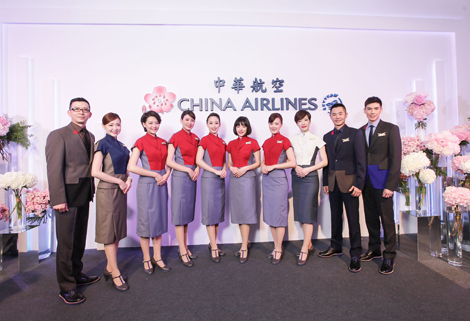 China Airlines has debuted new uniform designs, which will be worn by all cabin crew and ground staff from August 2015. 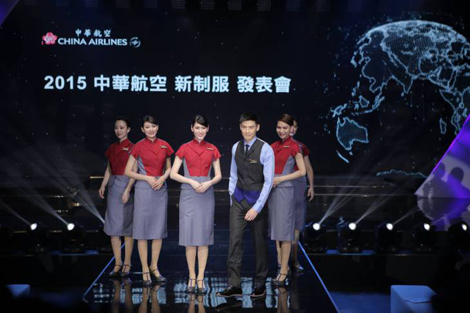 The new uniforms feature a “montage-like design”, with a combination of inspirations, shapes, and colours. The standard female uniform is based on the 1950s style cheongsam, a body-hugging one-piece Chinese dress. For the colour palette, Chang selected a base of sophisticated grey complimented by a generous use of red, marking a dramatic turn from the existing purple designs. The colour scheme and side-panelling detail has led some to liken the outfits to those seen in Star Trek. 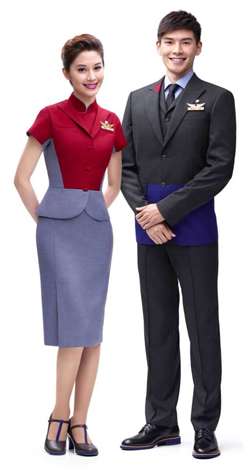 Meanwhile, the uniforms of female cabin managers and chief pursers will sport a different colour scheme, with the former dressed in black and white, and the latter in blue and gold. The male uniform design is less bold, and adheres to a more formal style. One noticeable feature is the panel of colour along the bottom of the blazer; the standard male blazer is grey with a flash of sapphire blue at the bottom, while the cabin manager’s jacket is primarily dark blue with a gold shade at the bottom. For the cold season, females will have an additional long black coat with blue details around the pockets. Males will wear a similar design with blue patches around the collar area.